“Once there was a little boy named Neftalí, who loved wild things wildly and quiet things quietly,” this story begins. “From the moment he could talk, Neftalí surrounded himself with words that whirled and swirled...” With spare, honest prose and luminous illustrations—and with neither polemic nor dilution—Monica Brown and Julie Paschkis have condensed the essential elements of Pablo Neruda’s life to create an amazing biography for the youngest readers and listeners, a picture book that Neruda himself would surely have loved. Neftalí’s childhood fascination with all that surrounded him—stones, shells, trees, flowers, “beetles and birds’ eggs and tall ferns that dripped water like tears”—and, especially, written and spoken words—became part of what made Pablo Neruda a poet. But beautiful things were not all that Neruda saw. As a young adult, he saw people struggling to survive; he saw “coal miners working dangerous jobs for little money.” As Neruda “joined those who fought for justice and wrote poems to honor all workers who struggled for freedom,” he was transformed into a “poet of the people,” whose talent and passion and courage spoke to and for poor and working people in Chile and the world. 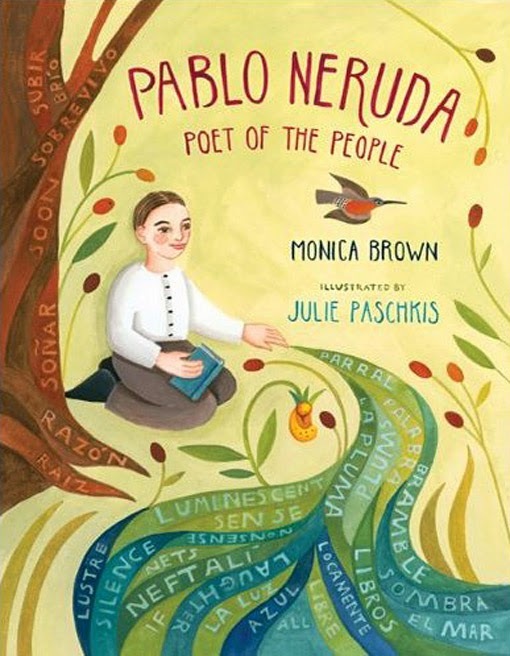 In an author’s note, Brown gives more information about Neruda’s life and work; and there is a resource page for further research. Effective companion texts would be Pam Muñoz Ryan’s The Dreamer, along with Antonio Skármeta’s The Composition, about a child’s facing fascism in his country. Both titles are reviewed on this blog. Together, Brown and Pashkis have created a stunning mosaic—in words and art—of the revolutionary genius Pablo Neruda’s life and work. Pablo Neruda: Poet of the People is highly recommended.